A Division of Carleton Counseling Company, Inc., based in St. Louis, Missouri, Le Petit Soldat has been offering the finest and rarest toy soldiers for over 35 years. We pride ourselves on outstanding customer service and fast shipping that our loyal customers appreciate and deserve. King and Country - We stock the entire line and typically have more than 600 different retired King and Country sets in our inventory. Plus, most of the Del Prado line made by King and Country is usually in stock - please email us for a list. We offer FREE SHIPPING in the U.S. on all orders of non-retired King and Country over $100! 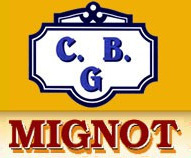 CBG Mignot - We are still the exclusive importers of Mignot and Lucotte for North, Central, and South America with the largest selections in the world! Mignot has drastically cut back on production ... No more special sets ... We cannot replace items on our list. Be wise, get them while you can! Lucotte - With nearly 200 different Lucotte sets, we have the largest stock anywhere! Be sure to check out our new Russian, Prussian, and Hanseatic League sets. Guy Renaud Standard Bearers - are simply the best of their genre. M. Renaud has retired..Hurry, only a few left. Brian Rodden Heraldic Sculptures - only a few 54mm foot, mounted, standards and doubles, are left in stock. In our opinion, these figures are at least on a par with, if not superior, to Courtney/Greenhill. Monarch Regalia - from Bangkok, Thailand. Their range of feudal Japanese Clans with Samurai, Daimyo, and retainers, both foot and mounted, is spectacular. ART IG's Fabulous Romans, Napoleonics, and Russians from Peter the Great to Nicholas II, are in stock. Although production has begun again, prices have doubled. Our old prices are a bargain! First Legion - Napoleonics and Zulu War figures are now in stock! Most are on the website, but inquire for a complete list. Inquire about our inventory of Beau Geste, Tommy Atkins' French Canadian Indians & WWI, Fusilier Miniatures' the Retreat from Moscow, and JG Miniatures' Scenics.